Knock, knock. – Who’s there? – Every fighter’s worst nightmare (according to UFC president Dana White). 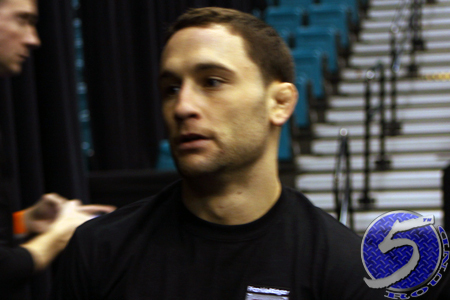 The Nevada State Athletic Commission has appointed controversial – and incompetent (if you were to ask White) – referee Steve Mazzagatti to be the third man inside the cage for Saturday’s UFC 156 superfight between Frankie Edgar (Pictured) and featherweight king Jose Aldo. Knock, knock. – Who’s there? – An extremely irate White. “I could go off for 45 minutes on officiating over [in Nevada],” White stated over the weekend. “Steve Mazzagatti is the ref reffing the [Aldo vs. Edgar] superfight. What more can I do (while turning his hand into a gun and pulling the trigger against his head)? Mazzagatti is reffing the superfight. What more needs to be said than that? It is highly unlikely either Aldo or Edgar will look to remove Mazzagatti from his spot. They are fighters entering the shootout believing they control their own destiny. Hopefully, that’s the case and the veteran ref quietly does his job in the shadows so the stars can shine. Or, he will emerge the same ol’ Mazzagatti White has grown to know and hate. UFC 156 takes place inside Mandalay Bay Events Center in Las Vegas. Aldo and Edgar (and Mazzagatti) headline the pay-per-view broadcast.